Late in June we had the driveway seal coated. Wait," I hear you saying. "This is supposed to be something about baskets." Well, yes. It is. Just be patient. The coating has to dry and cure. For the several days it is doing that it cannot be driven on. In fact, the first day or two you should not even walk on it. So our two cars were parked at a nearby neighbors' house. And we needed a few groceries - milk, yogurt, bread, cheese, etc. I could drive to the store. I could drive back to the neighbors' house. But then I had to get everything up to the house. 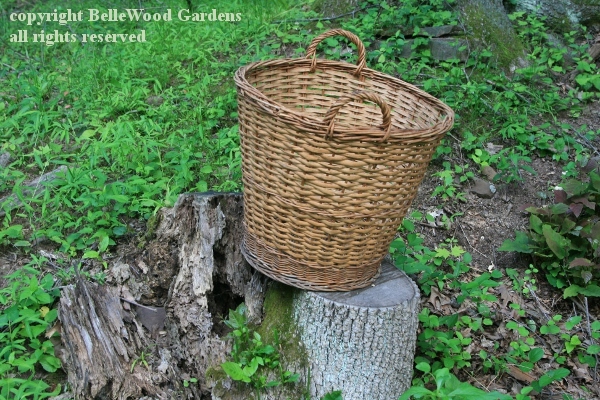 I used my sturdy ash splint pack basket. up the path through the woods to the house. 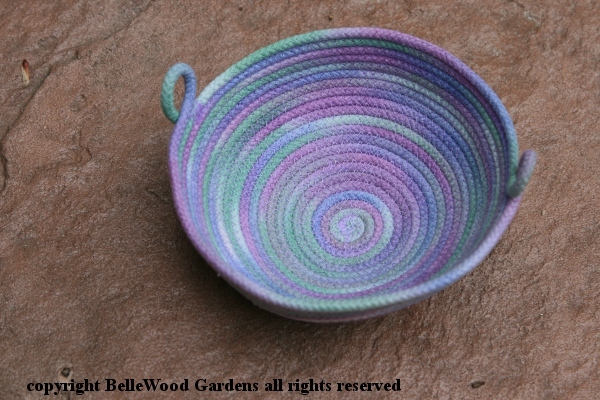 Baskets are wonderful things. Today they may be mostly relegated to decorative objects, replaced by paper and plastic bags, and cardboard boxes. 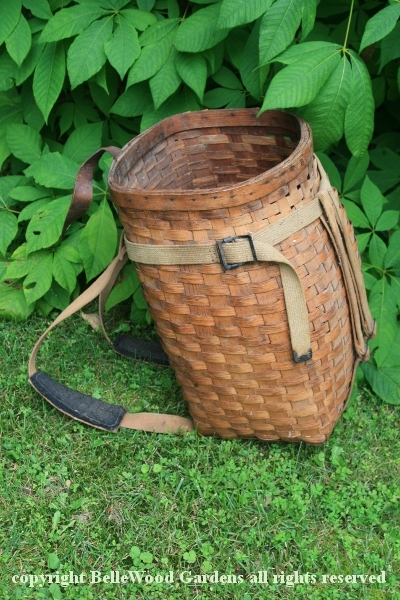 I would have had to make a couple of trips, flimsy bags in each hand, to take everything that fit in my pack basket with the weight riding on my shoulders. And hot air balloons float up, up, and away with a sturdy wicker basket for pilot and passengers. 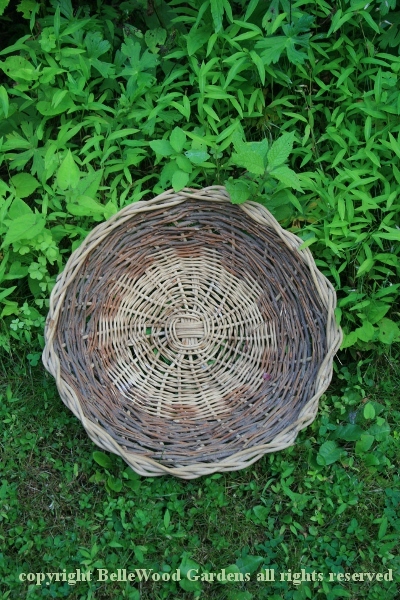 I also bought an ash splint bushel basket. 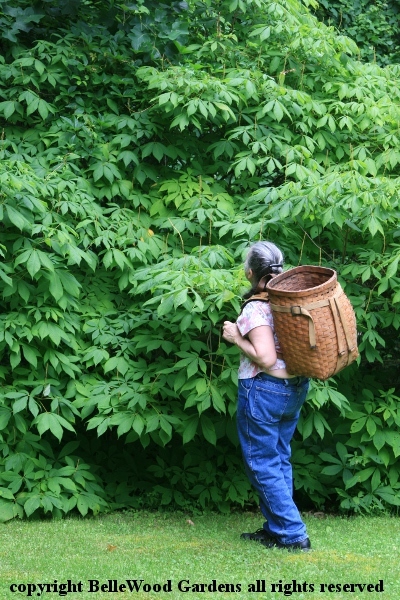 Baskets were made to specific sizes - a bushel, a half bushel, a peck. Some had a traditional shape - green beans had a proportionally narrower, taller shape than those for say, potatoes. The tall, slim shape would keep the green beans from heating in the days before refrigerated transport. 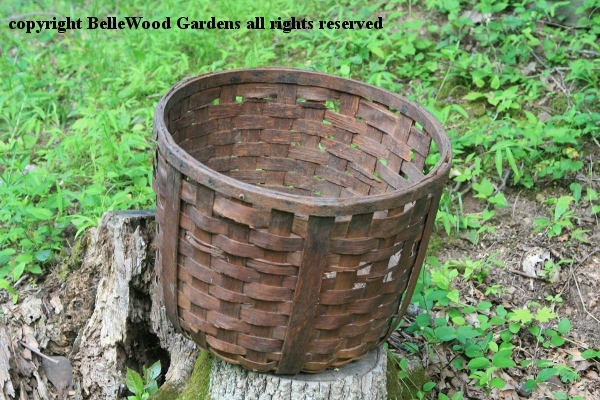 the clever, reinforced bottom on my sturdy bushel basket. Splint baskets take careful preparation before the weaving even begins. An ash log is pounded along its length to loosen the growth rings, which separate into the splints, or layers. The splints need to be cut to width needed for a particular basket. Splints must be soaked before using, to give them the necessary suppleness for weaving. The simplest pattern is over one, under one. I also have a wicker basket. No idea where or when it was acquired. 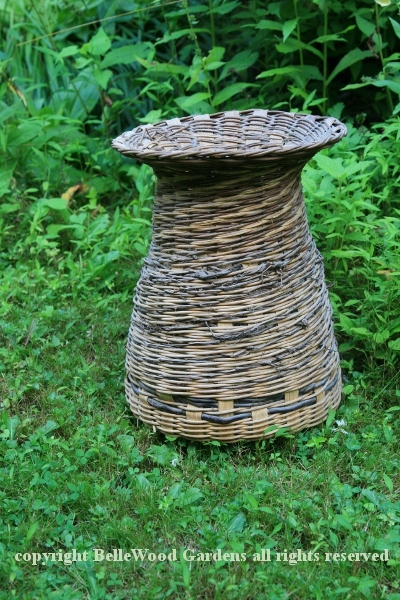 Laundry baskets are made of peeled willow withes, woven oval in shape. New born babies could sleep in one, padded with a blanket. Now-a-days laundry baskets are plastic, unless you special order them on-line. Ash splints. Willow withes. Wicker. Rattan. Grape vines and roots of Virginia creeper, sweet grass and palm leaves. 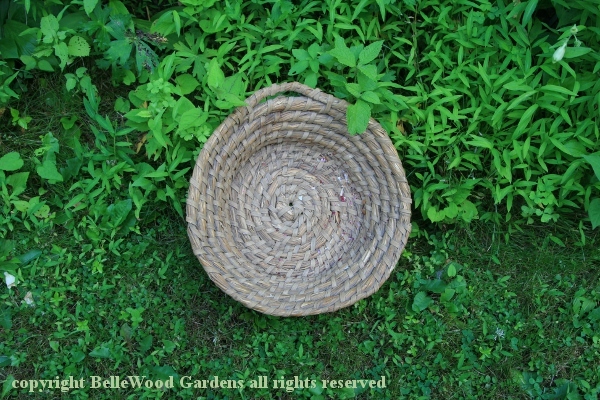 If it can be plaited, woven, twisted, perhaps it can become a basket. I have made a few. 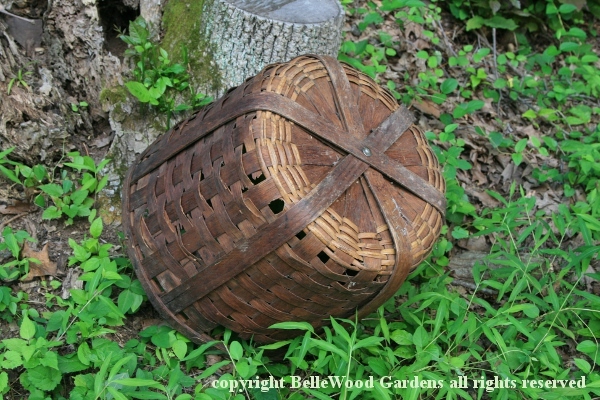 Ditto this small round basket, suitable for small clementine oranges. 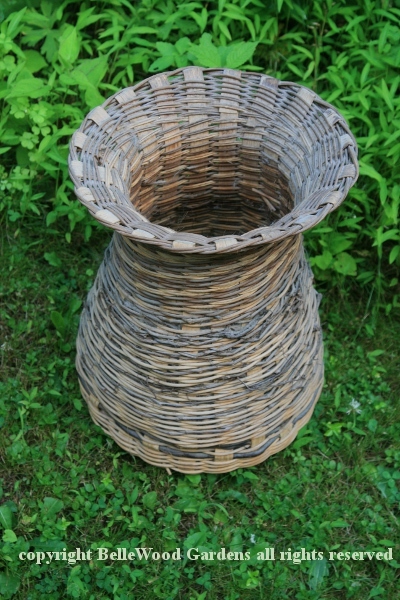 A shallow open basket to hold apples. Or mail. kept things consistent. Dust it with flour, then let bread dough rise. with a zig-zag stitch on her sewing machine. It's charming. So, a-tisket, a-tasket. Two words that actually have no meaning. 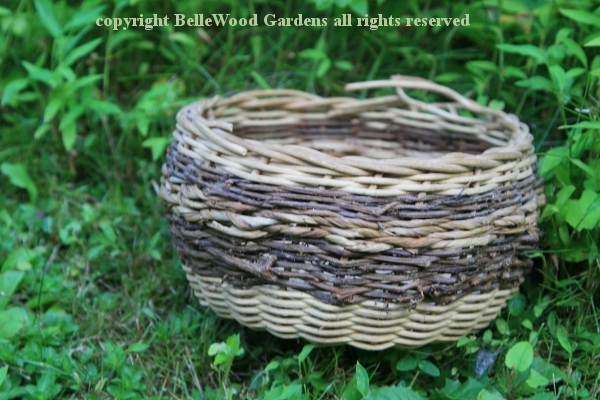 Baskets, on the other hand, have endless options and possibilities.